Hear Sam Smith Break Down His Bond Theme, 'Writing's On The Wall' "I wanted a touch of vulnerability from Bond, where you see into his heart a little bit," says the British singer. His theme song for Spectre, the latest film in the James Bond series, is out today. 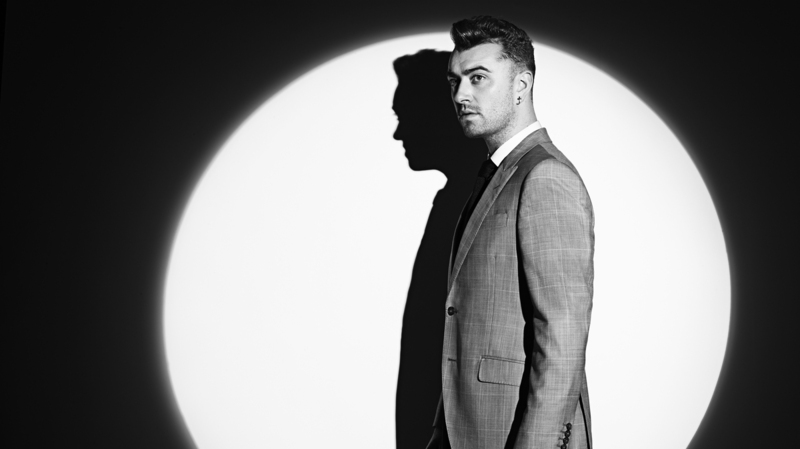 Sam Smith's famous voice will grace the opening titles of Spectre, the latest film in the James Bond series. Two years ago, Sam Smith sent an email to his agent, the subject line of which simply read "007." That message was the beginning of his bid to write the theme song for the next James Bond film, a lifelong dream for the British singer that comes true today. To mark the release of "Writing's on the Wall," Smith's theme for the upcoming Spectre, Smith spent a few minutes with Morning Edition breaking down the track. "I tried to put myself in the shoes of Bond," Smith explains. "My music is a diary and it's a recap of my life, and I wanted to bring that kind of honesty. In the lyrics — "How do I live, how do I breathe? / When you're not here I'm suffocating" — I wanted a touch of vulnerability from Bond, where you see into his heart a little bit." Smith says the song came together in one whirlwind session. He and collaborator Jimmy Napes wrote it in under half an hour and quickly recorded a demo. When they listened back to that recording, they were so pleased with Smith's vocal performance that they ended up using it on the final release –- albeit with some added muscle in the arrangement. "When it goes into the chorus, it's massive — and then I wanted it to sound like all the air was being sucked out of the song really quickly as it goes into 'How do I live, how do I breathe?' And then, it slowly raises again in that last moment to the final explosion, leaving it to the orchestra to then take it away," he says. Though he's longed for years to be the voice crooning over one of those iconic title sequences, Smith says someone else in his life might be even more excited: His uncle Terry, who was diagnosed with brain damage at birth, is also a James Bond superfan. "He's got every single poster, every single figurine," Smith says. "I just thought, how incredible that would be for him, and for the family and stuff, to do that theme song. It would be amazing. I'm not sure he even knows yet that I'm properly doing it. But I'm gonna bring him to the premiere."